Senior RB Kenn James is mobbed by his teammates after returning the opening kickoff 95-yards for a touchdown. TORERO STADIUM (10/05/2013) Senior quarterback Mason Mills completed 23 out of 27 passes for 413 yards and three touchdowns to help lead the University of San Diego Toreros (3-2, 2-0 PFL) to a 45-13 win over the Mercer Bears (4-1, 1-1 PFL) Saturday afternoon. Mercer is playing in its first season of football since 1941. This was also their first road trip after opening the season with four straight home games. Three Torero receivers went over the 100-yard mark. Junior Reggie Bell led the way with seven catches for 127 yards and a touchdown. He's gone over 100 yards in four out of five games this season. Senior Sam Hoekstra finished with four catches for 121 yards and a touchdown, all recorded in the first quarter. Brandon White also chipped in with six catches for 111 yards and a 50-yard touchdown. While the passing game was the key to success, senior running back Kenn James showed off his play making ability by returning the opening kickoff return 95 yards for a touchdown. The Mt. Carmel alum added a 50-yard touchdown run in the fourth quarter. 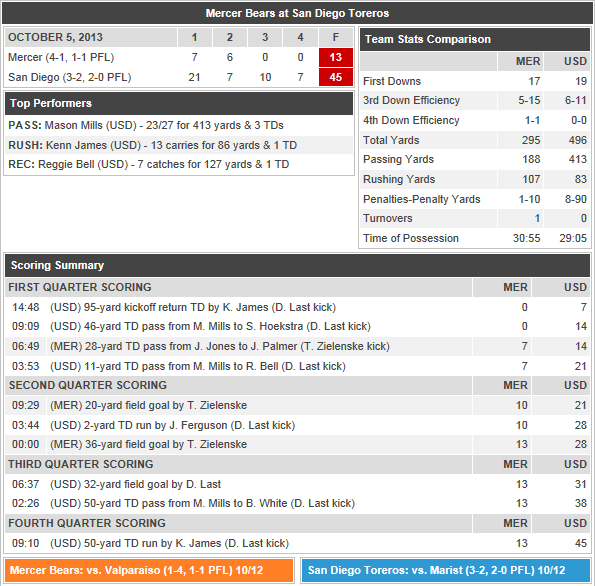 The Torero defense also came up big by preventing Mercer from scoring in the second half. Next Saturday, the Toreros return home to host the Marist Red Foxes (3-2, 2-0 PFL). Kickoff is scheduled for 2:00 p.m. pacific time.